Test ink is a standardized fluid used to determine the surface energy of a substrate that is to be coated. Test ink can be used for testing during processes as well as for incoming goods inspection and quality assurance purposes. The fluids, with progressively higher surface tension, are applied to the surface of the product. The behaviour of the rim of the test inks brush stroke within the first two seconds after applying, determines the surface energy of the sample. The video shows how measurement is performed. If the surface to be coated cannot be properly wetted, paint, printing ink and adhesives will not bond. However, good wettability is not always the same as good bonding: Other mechanisms in the relationship between the substrate and the coating material are decisive. Surface wettability can be determined with test ink before a printing, adhesion or painting process to serve as orientation. Destructive testing to determine the bond between the applied material and the substrate cannot occur until after coating. 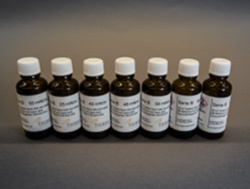 Series A ink pursuant to DIN ISO 8296 and ASTM D 2578-99a. This blue test ink is made up of a combination of formamide and ethoxyethanol (poisonous) in various proportions. It covers a surface energy range of 30 – 58 mN/m. This type of ink is the standard type and is most commonly used in the industry. It is suitable for PE, PP and similar substrates. This type of ink cannot be used on PU or on soft PVC. 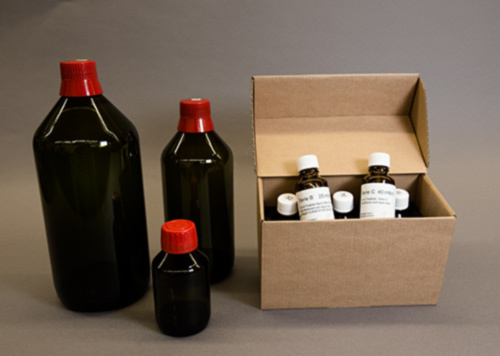 Series B ink is made up of methanol and water pursuant to DIN 53364 and DIN ISO 8296, red. The degree to which the fluids are toxic is a factor of the methanol content. 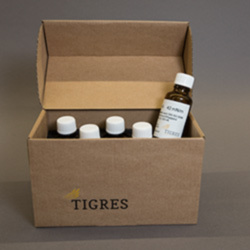 This test ink covers a range of 23 – 72 mN/m. It is safe for use on soft PVC. Series C ink is also red. It is a mixture of ethanol and water. This series poses no health risks and was developed in conformity with DIN ISO 8296. It covers a surface tension range of 30 – 72 mN/m. Because it is harmless and can be used on all substrates, this type of ink is becoming more and more common on the market. In compliance with DIN ISO 8296, series D test ink is blue and is made of formamide and water. It covers the range of 58 – 72 mN/m and serves as an extension or complement to series A. Because of the formamide content, these mixtures are classified as poisonous. Series E is the alkane series, corresponding to these surface tension values: 16, 18, 20 and 25 mN/m. The polarity of these clear fluids is zero. Series F is made up of water and table salt. With 77 and 82 mN/m, it covers values greater than the wettability of 72 mN/m. Values determined with test ink from different series are NOT comparable! The ink bottles have paintbrush caps. To prevent the surface tension of the ink from being impacted by substances picked up during measurement, the paintbrush should be rinsed with methanol and dried after every use as specified in DIN ISO 8296. You can also use a cotton swab to apply the test ink instead. Then simply dispose of the swab after use. The ink bottles are made of brown glass, preventing light from greatly affecting them over time. If the bottles are used often, DIN ISO 8296 specifies that they should be replaced every three months. Every time the bottle is opened, solvents evaporate from the fluid. Or when used incorrectly, impurities can get into the test ink and change the surface tension.